Chief Minister Virbhadra Singh flagged off a truck carrying relief material for the rain and flood affected areas of the Kinnaur district here today. The relief material worth Rs. 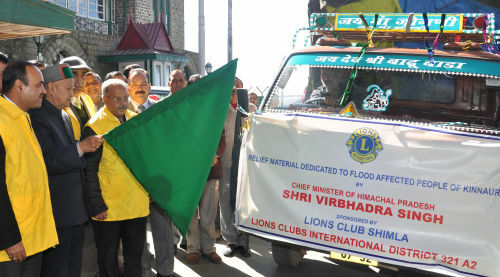 four lakh comprising 200 kits was sponsored by Lions Club Shimla. Chief Minister thanked the Lions Club for this contribution and said that such noble gesture by Lions Club Shimla would inspire the other organizations to come forward for assistance of the needy. Chairman Lions Club Shimla Prof. K.D. Chandel said that 70 kits would be distributed in Nichhar and 50 kits in Sangla on 15th November while 80 kits would be distributed to the affected families at Reckong Peo on 16th November, 2013 under the supervision of District Administration. President Lions Club Shimla Dr. Rajesh Chanana, Chairman Advisory Committee Ravi Chand Sud, Secretary Vimal K. Sood, Immediate Past President Sunil Sood, office bearers and other members of the Club were also present on the occasion.